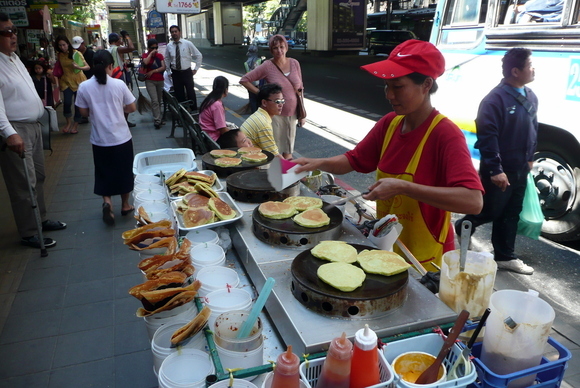 Last week I shared a picture of a pancake vendor I discovered near the Thong Lo Skytrain station. Well, I went back yesterday and bought some of her pancakes. For comparison’s sake I walked upstairs to a vendor at the station and bought a waffle, too. The pancakes have little slices of pumpkin throughout. They are pretty thick but not too terribly sweet. 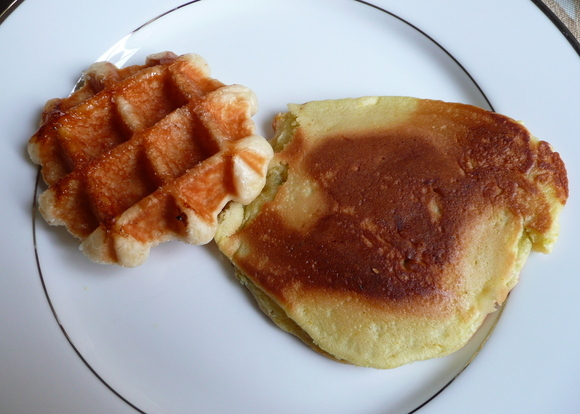 The waffles are a yeast dough and are really undercooked and doughy inside. About two bites into the waffle and I had had enough. Both are pretty heavy snacking but if I had to choose, I’d go with the pancakes. In the past eighteen months or so, I’ve discovered how wonderful a tool Facebook can be. I’ve reconnected with literally a few hundred former colleagues and classmates who I had not seen or heard from in years. It is really nice to be able to see what they’re up to. It is the perfect level of “in touch-ness” for most people: I want to know what they are up to but I really am not so close that we need to be emailing or talking regularly. Sure, there’s a part of me that thinks, “Lord, what’s the point?” and wants to just cut the ties. I have so many other things to do with my life. But I don’t spend a lot of time on Facebook, so drastic actions aren’t necessary… yet. But a recent redesign by the powers that be at Facebook has made life difficult and might make drastic action necessary. The new design finds them chasing after Twitter, the faddish “your life in 140 words or less” networking service. Now I face an endless stream of updates form my 400+ friends and unless I log in to check this stream at least every other hour, the updates pass me by like corks floating in the Colorado River. The problem with this came to a head this weekend when I missed an update from a former colleague about her going in for chemotherapy this week! I hadn’t been aware that she was battling cancer and if another friend hadn’t mentioned it to me, it would have completely escaped my attention. Something had to be done, otherwise there would be no point in staying on Facebook. “You can filter the updates,” Facebook assures us. Well, I ended up spending five hours this weekend, sorting through all my friends and lumping them into categories based on where I know them from: family, high school, university, online, current job, former job, etc. Now, after all that work, I have a much more manageable stream of updates. Logging on once a day is enough to see what people have been up to in the past twenty-four hours. About six (or was it nine?) months ago I was participating in the monthly Critical Mass bicycle rides here in Krungthep, held the final Friday night of each month. Based on their counterparts in San Francisco and dozens of other cities worldwide, CM is about creating a space where bicyclists can safely ride the roads, demonstrating the significance of our numbers to the drivers of motorized vehicles, and calling attention to the importance of including bicycles in the overall scheme of transportation. As rainy season arrived, attendance at CM diminished, particularly after one Friday night where the two or three dozen of us ended up riding down Sathorn Road in a heavy rain. We were soaked by that point and seeking shelter was pointless, so we kept riding until we reached the river. Perusing the Thai-language web board at Thailand Cycling Club’s website, I discovered that CM was once again happening. In addition to the Friday night downtown ride there is now a weekend daytime ride on the second Saturday of the month, held up at Railroad Park near Chatuchak Weekend Market. A Thai friend, Poom, confirmed that CM was drawing a good number of people, so Stuart and I decided to join. After setting out from home at 5:30 and stopping by the ProBike store next to Lumpini Park to buy some new headlights (so much brighter than the old ones! 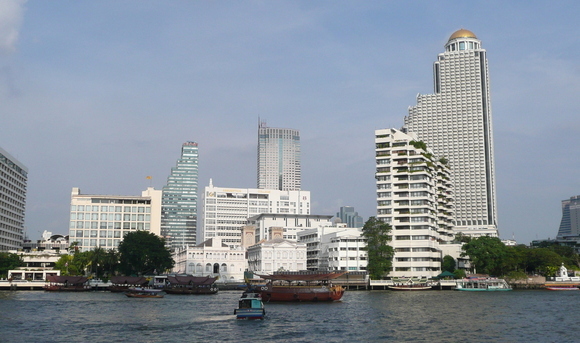 ), we arrived at the new Bangkok Art and Culture Centre, located right across from MBK and Siam Discovery Centre malls on what has to be one of the most valuable properties in the city. 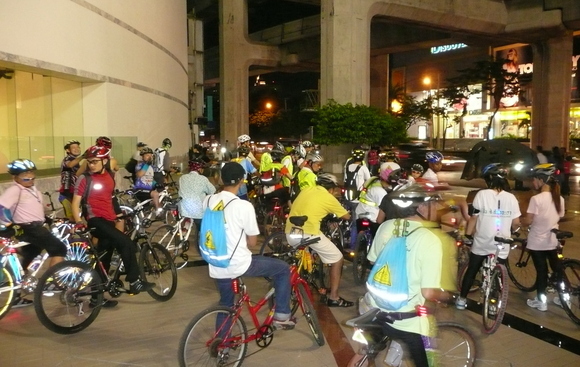 About sixty cyclists joined and we set off in a reasonably cool and breezy evening, riding up Phahonyotin Road then turning eastbound onto Lad Prao Road. 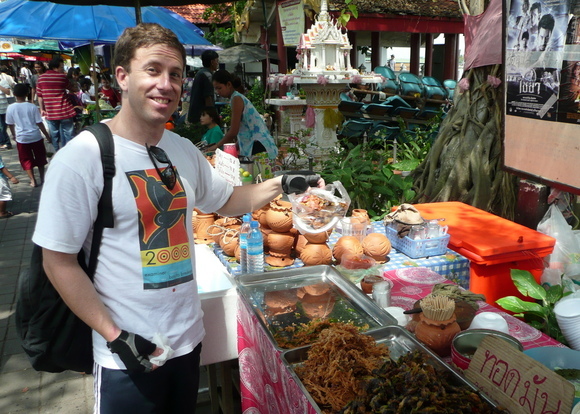 After about 15 km the group stopped at a night market to eat. By this point we were pretty far north of home so Stuart and I decided to continue without the group and return to our neighborhood before eating. Sure enough, after a 40 km circuit which retraced a good part of the previous Sunday’s homeward-bound path, we had worked up a hearty appetite, which was satiated at Great American Rib Company on Sukhumvit 36. Nothing like some mango margaritas and pulled pork shoulder to add back on those calories that were burned off on the ride! It’s Saturday, so let’s have a food entry, shall we? Not that we need any excuse for a food entry. 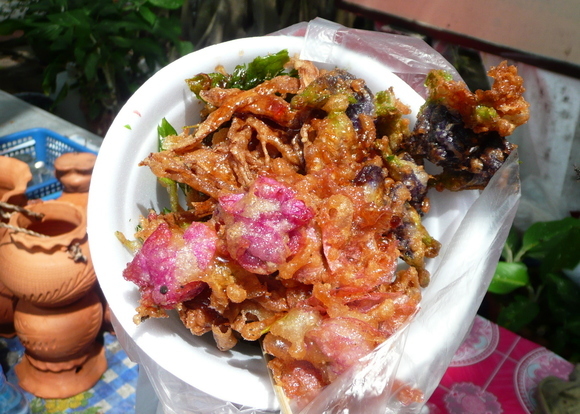 A notable aspect of Thai culture is the snacking. There are always vendors handy selling food and Thais, not unlike Hobbits, eat many more meals in a day than the typical three. Why do they do it? Without a doubt, the answer has something to do with how fun it is to snack. For the most part, Thais maintain their skinny figure because they aren’t over-eating, just nibbling a little here, a little there. Most of these snacks are pretty healthy, too. And since snacking is even more fun when it is done with others, they share their snacks with friends and don’t eat nearly as much that way. From time to time, non-Thai foods manage to find their way into the snacking scene, probably with not so good results on the waistline. Waffles are one example. Many of the Skytrain stations have vendors who sell these small, yeast dough waffles. They’re very sweet. Then there are the crepe vendors. We’ve started to see these over the past few years. It is a take on the Japanese version of French crepes: cooked very dry and then rolled into a cone shape and filled with either sweet or savory fillings. No Nutella here, though. This week, though, I saw the strangest thing: one of the crepe vendors was actually making pancakes. Yes, yes – I know that crepes are a type of pancake. But these were big, thick, American-style pancakes. Surprised, I stopped and asked if I could take a picture. She just looked at me like I was an alien but didn’t say no, so I snapped away. I was on my way to lunch so I didn’t buy one and try it. But I’ve now seen her twice in front of the Thong Lo post office, so I’ll have to go back and see what flavor they are. You can see that she has some crepes prepared, too, on the front of the cart. The largest population of legal foreigners in Thailand are the Japanese. I’d imagine that the number of Burmese, Lao, or Cambodians may be higher, but many of them are probably not here legally. One of the benefits of having so many Japanese here is that we can get pretty good Japanese food. 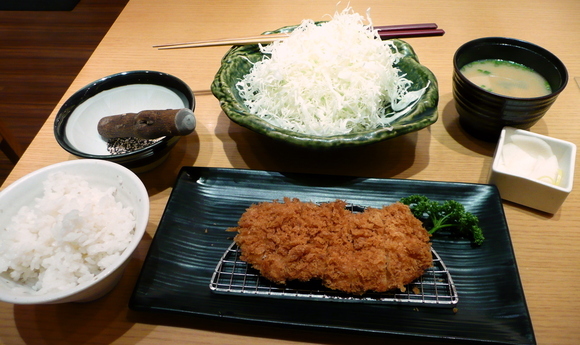 One of the items that I really like is tonkatsu, the pork cutlet that is breaded in panko and then deep-fried. When done perfectly, tonkatsu is moist with a crunchy exterior, very flavorful, and not at all greasy. Of course, average tonkatsu is a dime a dozen. Recently, though, I read a review for Saboten restaurant, located on the sixth floor of the Isetan department store (a Japanese chain) at Central World Plaza. Oh, this place makes good tonkatsu! First of all, the place itself is very bright, beautifully designed, and obsessively clean. The service is very good. In general, Thai service standards are quite high, but here they bring it to an even higher level. Every time someone approaches the table, they give a little bow, even if they are just refilling my tea. The menu is simple: they offer only tonkatsu and only about six different varieties. Meals come with a bottomless bowl of shredded cabbage, which you can dress with either a sesame dressing or a vinaigrette. Rice and miso soup are also bottomless, although one of each is always enough for me. The tonkatsu is amazing: the panko are perfectly textured with not a drop of oil. Nothing about the crust is soggy at all! The meat is tasty and moist. The sauce, which is mixed with toasted black and white sesame seeds that you grind yourself, is just a tad too sweet. Another restaurant we know has a slightly spicy version that really is nice. But all in all, this is good tonkatsu. The best part is, it really is quite reasonably priced at about 300 baht. Yes, a lot more than a 30-baht bowl of noodles from a street vendor. But for what you get, it is a great value. 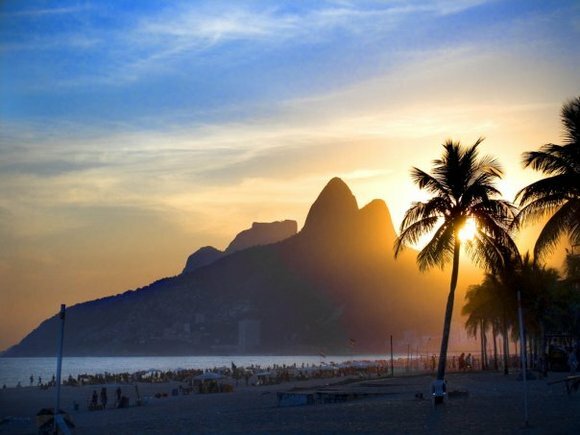 Finally, let me leave you with this photo from Ipanema Beach in Rio de Janeiro. This comes courtesy of Prachya, who took it last year while on holiday there. Normally I don’t post others’ photos, but when I saw it on his Facebook album, I thought it was so pretty that it should be shared with you! I hope you enjoy it. Less than an hour after returning home from the 90+ km bike ride on Sunday, I had to turn around and head out with Tawn for an evening social event. One of Tawn’s childhood friends is the director of Satit Bilingual School of Rangsit University, located north of the old Don Meaung Airport in Pathumthani Province. As part of the school’s emphasis on an international, Thai-English education, this is the second year they’ve mounted a production of an English language musical. This production, into which a great effort was put, was of “The Sound of Music”. 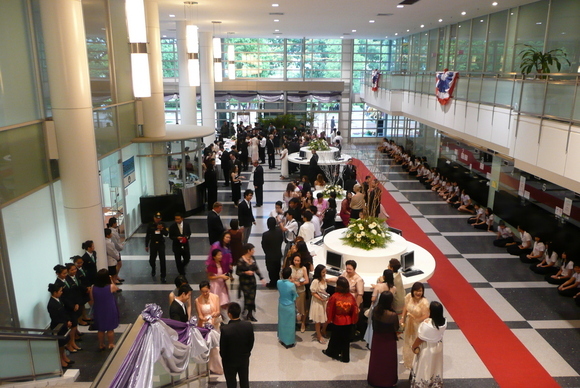 Running multiple days and featuring the university’s orchestra and a cast of primary and secondary school students, this special event was attended by Her Royal Highness Princess Soamsavoli Kitiyakara, the former wife of His Royal Highness the Crown Prince and mother of the first grandchild of Their Majesties the Kign and Queen. 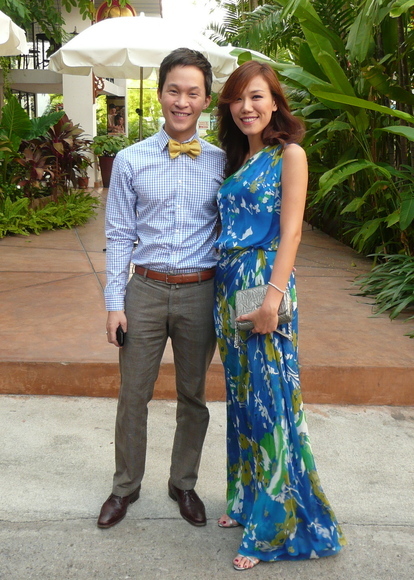 First we stopped to pick up another of Tawn’s childhood friends, Mon, who looked stunning in her outfit. We got a little lost in finding the school but had left home plenty early, so arrived with an hour to spare before curtain. There were police everywhere – I’d imagine 200 or more officers are used whenever a member of the Royal Family goes to some event – but fortunately as friends of the school’s director, the guard pointed us to what he called the “IP” parking. I guess we didn’t make “Very” status, only “Important” status! Pim and her daughter Tara greeted us. 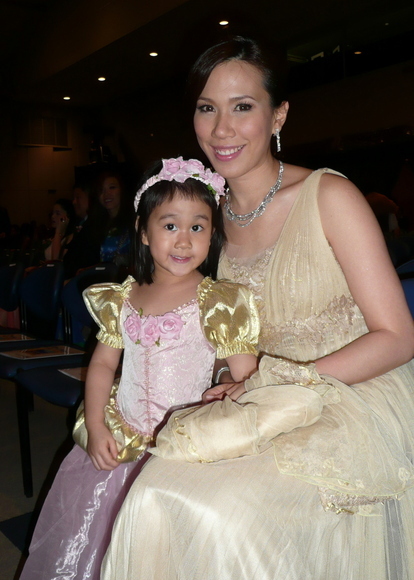 Tara had a special responsibility along with another young girl: to give a present to the Princess. 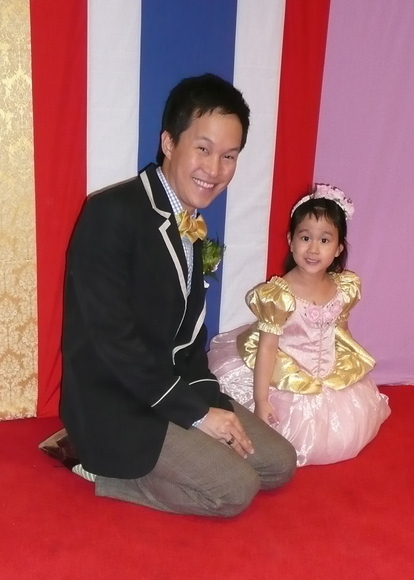 Kind of like the role of a flower girl in a wedding, she was all dressed up (as a princess, no less!) and when the time came to curtsey then walk up to the Princess, Tara and her friend needed a lot of guidance from one of the Naval Protocol Officers. There was a large reception in the administration building. We were upstairs in a secondary reception area – the IP area, I guess. Notice the red carpet in the picture below. This was set up for the Princess and students were sitting the full length of it, neatly dressed, awaiting her arrival. We entered the auditorium about twenty minutes before show time. 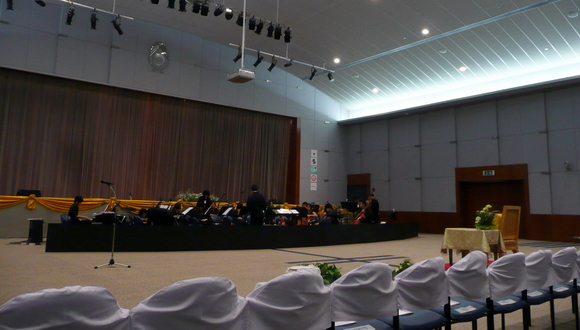 Oddly, the chairs were set some distance back from the stage and orchestra. You’ll notice the raised platform and special chair set up for the Princess. We’ve been many arts events where a member of the Royal Family has attended and I always think they must get a bit lonely because even if they attend with friends or family members, the highest ranking person is always set on a pedestal, away from all the other seats. The show itself was interesting: they removed almost all of the dialogue between the musical numbers, so the entire show was done in less than ninety minutes, compared to the usual three hours. If you weren’t familiar with the story, though, you could easily have become lost. Who is this person delivering mail? Why is Maria going back to the abbey? Who is the Baronness? How was the singing? Well, Maria and Captain Von Trapp were not the strongest singers. Some problems with the microphones and amplification made the situation even worse, rendering their high notes nearly inaudible. The girl who played Liesl, though, had a lovely voice and her duet with the boy playing Rolf (“Sixteen Going on Seventeen”) was one of the high points of the show. The biggest thing that tickled me was the accents. I know, I shouldn’t laugh at this, but it was so cute as many of the students are Thai and some of them speak English with a strong Thai accent. Especially the boy playing Captain Von Trapp. When he spoke, I couldn’t help but think of Yul Brenner saying “etcetera, etcetera, etcetera” in The King and I. Awful thing to say, huh? After the show we stood as Her Royal Highness departed to the playing of her own anthem, and then took some more pictures before heading home. Needless to say, I slept very well Sunday night after a bike ride, a drive all the way to Rangsit, and then an exciting musical performance. In what was my longest ride yet here in Thailand, I joined the Thailand MTB group for what was billed as a 70-km round trip to Ko Kred (Kred Island), a car-free ethnic Mon enclave in the middle of the Chao Phraya River north of Krungthep. Poom, an American-educated Thai who I met on some Thailand Cycling Club and Critical Mass rides, extended the invitation and I forwarded it on to Stuart. I’ve never ridden with Thailand MTB (“mountain bike”) before but am always up for a new adventure. The adventure required me to be up Sunday morning at 5:00 so that I had time to shower, stretch, eat a bite and check my tire pressure before meeting Stuart on Thong Lo about 6:30. From there we met up with Poom at Wireless Road and then the three of us continued to the Sathorn District office, which is tucked away down a small soi in the Sathorn/Silom business district. This first leg added about 10 km to our journey and we hadn’t even official started the ride yet. Thailand MTB is mostly the younger, rougher, more testosterone-driven types (they are mountain bikers, after all) compared with the more varied group that you find with the Thailand Cycling Club. That’s okay, though: I wanted to ride harder and faster than the usual liesurely pace of the TCC events. Push hard we did. It was a hot and humid morning and we didn’t make our first stop along the route until we were up at the point where the north-bound route makes a hard left turn to the west. This was some 20 km from our starting part on Sathorn. By about 10:00 we arrived at the ferry to Ko Kred. After taking the wrong ferry we finally ended up at the island. 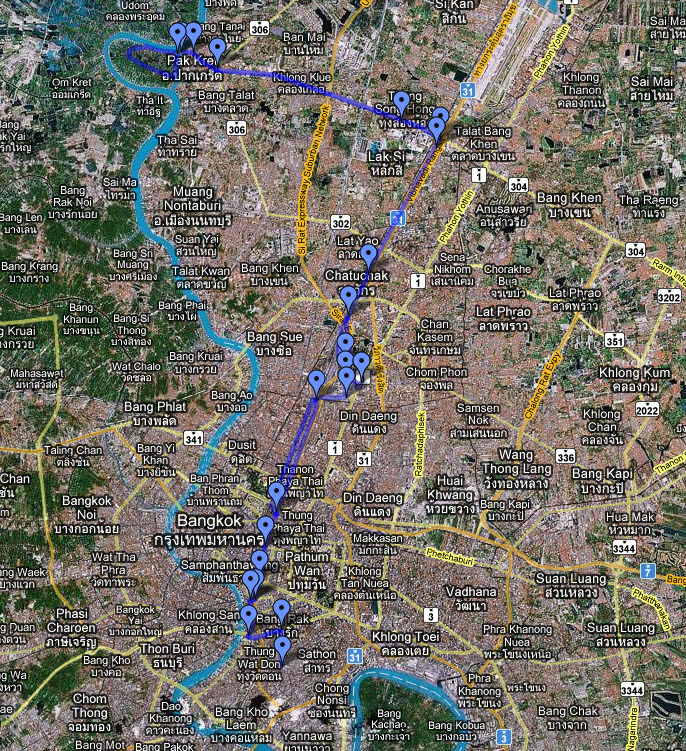 As mentioned before, Ko Kred is in the middle of the Chao Praya River. It was just a peninsula at a bend in the river but in the early 1700s it was decided by the Siamese government to build a canal through the peninsula to create a more direct shipping route to the old capital of Ayuthaya. Over time, the canal was widened and now it is the main river channel. The island is still populated with ethnic Mon. A popular day-trip for Thais, Ko Kred is automobile free, mostly marshland with elevated concrete paths connecting different parts of the island. Along the way there is no shortage of vendors seling nick-knacks, food, and the earthenware pottery for which the island is famous. We ate lunch at one of the two temples, both of which have large markets, then did a 5-km circuit of the island, dodging the mostly Thai tourists. On the far side of the island we stopped at the second temple. Stuart and Poom bought some fried food, the exact ingredients of which are unclear. I think they were vegetables with one maybe being a flower blossom? Above, the mysterious fried foods. I decided that oil didn’t meet my needs so instead opted for homemade coconut ice cream with sticky rice and peanuts. At the ice cream stand, an older lady was passing with her two young grandsons. They stared at my in my bicycle helmet and sunglasses and commented about the farang. I responded by saying hello and asking them if they knew how to speak English. Shy, they declined to answer. Their grandmother smiled and prodded them: “Sure you can. You learned how to say ‘Hello’ right?” They nodded at her but were still too shy to practice their vocabulary word with me. 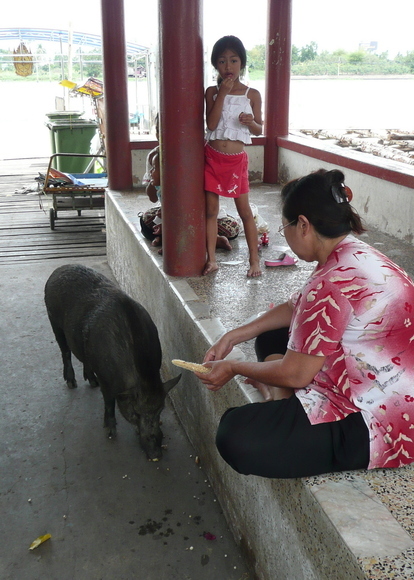 While at the market, I noticed several stray dogs wandering near a riverside pavillion, earing scraps of food. One looked quite large and, upon closer observation, I realized it was a wild boar, left. Nobody seemed too concerned that a boar was wandering around the market so I didn’t worry about it either. We regrouped at the ferry pier and started our ride back. By this time it was 1:00 and we were under the open sky, hot sun evaporating our sweat nearly as quickly as it appeared on the skin. Poom was riding a collapsable bike, one of those types with small wheels that can easily be brought onto a train or bus. The problem is, smaller wheels means you have to pedal more. On the way back, this extra effort was beginning to show. He fell a bit behind and so Stuart and I slowed up so as not to abandon him. At the next stop, we told the rest of the group, who was eager to ride like the wind, to go ahead without us. We knew our way back. An hour later we were at the Mo Chit Skytrain station, near the Chatuchak Weekend Market. Poom decided to call it quits and ride the train back to his car. That sounded fine to me, as we had already put in 68 of our planned 70 km. Stuart’s ambition stepped up, though, and he said he was going to push forward and do the last 20 or so kilometers home, taking another route down Lad Prao Road, connecting to Ram Intra / Ekkamai. The return route isn’t on the map above, but Stuart mapped out the whole course at this link. Never one to look like a quitter in front of others, I joined him. Ninety minutes and a lot of traffic later, I pulled into my condo’s car park with 92 km on the odometer, exhausted but satisfied with my accomplishment. Almost six months ago a friend of ours from Toronto emailed to say that he and some of his friends had booked flights to Thailand and would be in Krungthep several days. Their planned route was from Hong Kong to Samui Island and then arriving in Krungthep on Thursday the 19th and leaving on Sunday the 22nd. Exciting news! We haven’t seen this friend in two years since our last trip to Toronto, which was just an overnight trip. Over the past several months we’ve anticipated this trip, corresponded about it several times, and were eagerly awaiting his arrival. So Thursday came and went without a sound. No phone call, no email. Friday passed in the same manner. Saturday morning I checked my email and there was a message, sent from his friend and fellow traveler’s account, saying they had arrived late Friday night and could we give them a call to meet up on Saturday. I made dinner reservations at a nice riverside restaurant, one that has a great view of the sun setting behind the Temple of Dawn. I called back just after lunchtime and left a message that we probably couldn’t do such a late dinner since I had a 6 am meeting time for a ride Sunday morning, but we would stop by the hotel later in the afternoon and visit. We spent the next two hours enjoying that view. The sun set. The lights came on. Once the mosquitos started coming out – going on 7 pm – we decided it was time to head out. I left another message then we retrieved the car and headed back across the river. 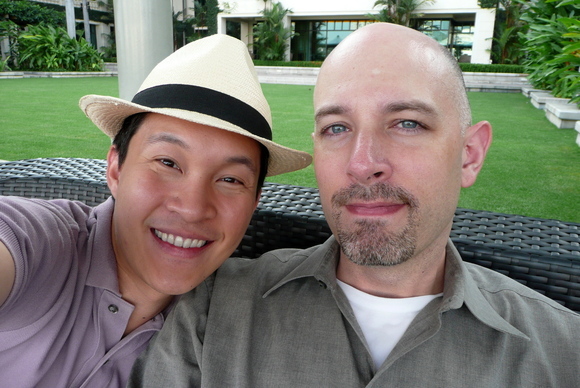 Self-portrait at the Riverside Terrace with the Peninsula’s uber-green lawn behind us. It was thirty minutes later as we were walking into a restaurant for dinner that I received a call. The friends had decided to go watch a movie at Siam Paragon – ostensibly a 2:00 pm show – and they had misunderstood the showtimes and had only just returned to the hotel. Unfortunately at that point, it was too late to coordinate meeting up. Their flight was the next morning and I had that early bike ride that I had committed to. 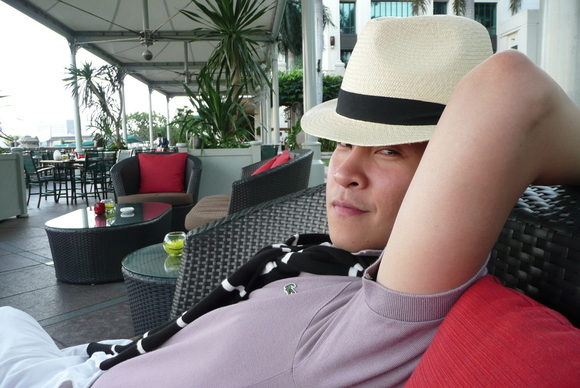 Tawn looks stylish in his fedora after a cosmopolitan. I’ve sent the friend an email to check whether he’s made it back to Toronto safely and to apologize for missing him. I also explained that I must have misunderstood his travel dates as I thought he would arrive on Thursday, not late Friday. No response yet. In the end it doesn’t matter. Missed connections happen and in this day and age, we can still easily stay in touch and I’m sure our paths will cross again. Still, there’s a part of me that feels like he didn’t make much effort to connect. Six months of planning and it came down to a decision to go watch “Valkyrie” with Tom Cruise instead of being where he said he’d be so that we could meet up with him? That doesn’t make me feel like Tawn and I are much of priority. Anyhow, we enjoyed a nice view of the river and the opportunity to take some pictures, embedded above. Sometimes I think I suffer from cooking ADHD. I try out a new thing for a while, then decide that I’ve done that and move on to something else. A few months ago it was pan-seared duck breasts. Last year I was doing the whole wheat sourdough starter (which I would still be doing if I hadn’t killed it). Maybe I just like the challenge of exploring a new type of food, a new ingredient, or a new cooking technique. Once I have tried it and understand it, I feel like it is successfully in my repertoire and so I search out something new. 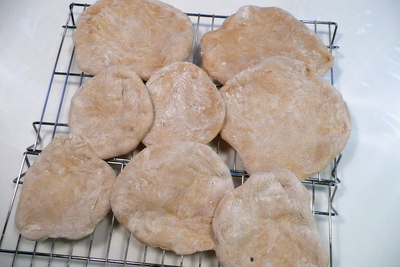 Recently, I’ve been thinking about pita bread. We have a good-sized population of expats from various Mediterranean countries and enjoy a few restaurants that cater to them. My favorite is Beirut, but there are others. Locally-made fresh pitas are available in two types – softer/more doughy and drier – at my local Villa market. Even the drier type is a far cry from the tough-as-shoe leather pitas I remember from my childhood. 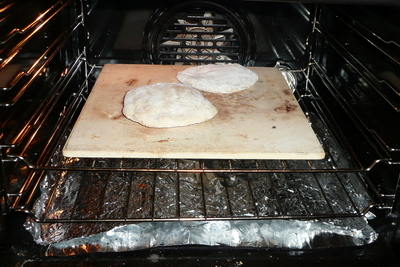 But I wanted to make my own pita bread. So I did. Turns out it is pretty easy. The biggest challenge is making the individual breads evenly round and the same size. 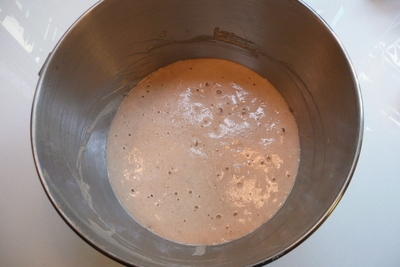 First step: Mix whole wheat and white flours, water and a small amount of yeast. Combine until it forms a very wet sponge then let it sit for several hours. 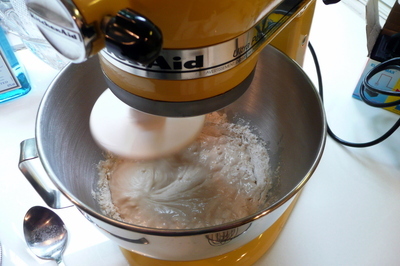 Second step: After the sponge has a foamy surface, add more flour and combine into a dough. My dough turned out really sticky, almost to the point of not being able to handle it. Am not sure what it should look like, but next time I’m going to cut back on the liquid a bit. Third step: let the dough rise for another hour or two, until doubled in volume. 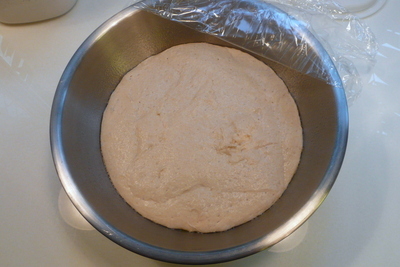 The dough can be refrigerated and used over the next several days. The flavor will improve over time due to fermentation. 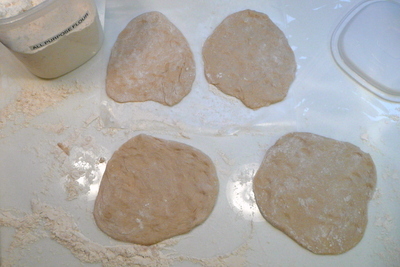 Fourth step: Form the dough into individual breads, rolling it about 0.25 in / 0.75 cm thick. As you can see, my dough was so hydrated I had to use a lot of flour. Also, I didn’t manage to get consistently sized and consistently round breads. I like to say that they are “rustic” or “artisinal”. Fifth step: Baking. Heat a baking stone, some unglazed quarry tiles, or a cast iron skillet in a very hot oven – 450 F / 220 C. Then cook the breads, a few at a time, on the stone. They only take about three minutes to cook and there is no need to turn them over. Sometimes they puff up, but according to the recipe, sometimes they don’t. Set them aside on a rack to cool a bit. They can be stored in a tea towel to keep them fresh and warm. They can also be reheated before use. Even though they have that rustic look, the flavor and texture was spot-on. I prepared Indian spice pork chops, marinated in a rub for a few hours so the flavor really soaked in. 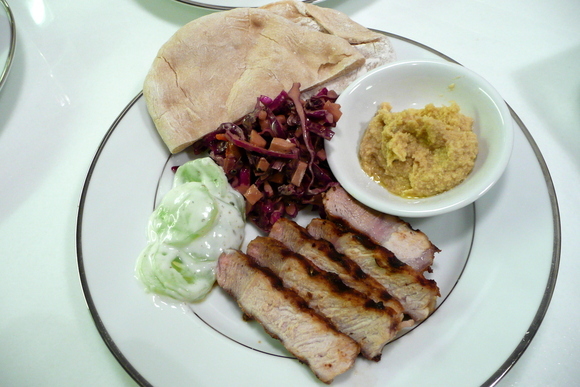 Served along with homemade hummus, a red cabbage cole slaw, and salted cucumbers with plain yogurt. Quite a tasty dinner. San Francisco in April – Interested in subletting a fully-furnished apartment in San Francisco for a few weeks in April? It you or someone you know is interested, please send me a message and I’ll connect you with my friend.